A gentle rain is falling on Paris. The residents seem a bit subdued after last night’s loss to Germany in the World Cup. The gray pallor of the sky matches the mood in the area. This is our last full day in Paris. One child is exploring the city solo and the others with my wife are visiting the Musee de la Poupee, a museum of dolls. I’ve volunteered to do laundry and to cook dinner, as we leave early in the morning for our bike trip and wanted to avoid a long restaurant dinner. There’s a Bolognese sauce simmering away. The laundry machine is gently abuzz. It has been really fun. For me, it has been a novelty to visit a foreign land and get by with rudimentary language skills. It is a challenge to speak French and risk making a fool of yourself. Airbnb is great. This is our first time using the service, and we are believers. Not only are we saving a ton of money vs. staying at a hotel, but we feel like we are getting a more localized experience. Our host, Joël, is very kind, responsive and gentlemanly. In his flat, we found a good-sized area filled with much natural light, a very workable kitchen and little street noise. Joël also kindly left a bottle wine and boxes of cookies. The place is conveniently located to multiple metro stations and numerous bakeries, cafés, grocery stories, restaurants, minimarts and wine shops. The view from our porch is up top. The red building is where the Statue of Liberty was built. It has been a wonderful place for our family. Thank you, Joël! 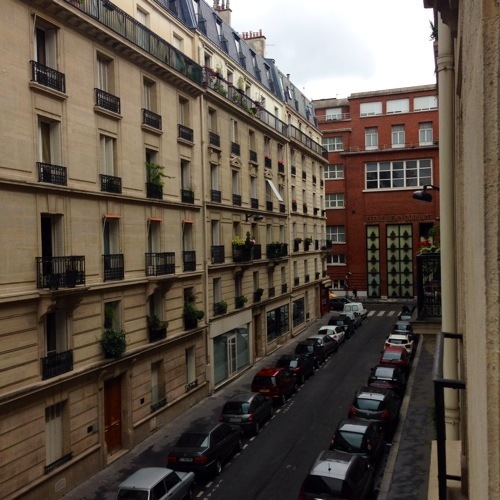 Paris is both familiar and different. To me, it feels a lot like Manhattan. Shops and public transportation everywhere. You are only a minute or two from buying whatever provisions you need, as every block or so has its own bakery, minimart and coffee place. To me, I’ve not found Parisians to be rude at all. In face, they’ve been very warm and kind. But, they are city people. Time is precious. So, shop owners want you to order quickly when there is a line snaking outside their doors. Citizens prefer that you not clog the sidewalk as a group walking at 1 mph, when they are trying to get somewhere. In other words, it is like NYC. But, we are clearly in a foreign land, which leads me to the comments below. Show respect, get respect. Two members of our family speak basic French. The rest of us are pretty clueless. But, we’ve found that when we try to speak, the reception has been great. Usually, we find at the end of the meal that the waiter speaks fluent English. But, they seem very appreciative that we try to speak their language. We also make a point of dressing up a bit. Parisians have a lot of style and Europeans in general dress up a bit. We are not wearing anything formal, but we left at home T-shirts, white sneakers and shorts. At dinner, I wear a blazer. The proprietors seems to appreciate it, as we are receiving extremely hospitable customer service. Most important, I’ve learned an important life lesson. I’ve tried to show my children that is more than OK to try and speak French, even when the results are imperfect. My French pronunciation is horrible. But, I go for it. Some of my children seem to like that I try. I hope they realize that trying is important, even when the result are mediocre. But, the secret of my stay in Paris is this: just trying is good enough. The folks here have responded with sincere good will. They weren’t expecting perfection. Only I was.